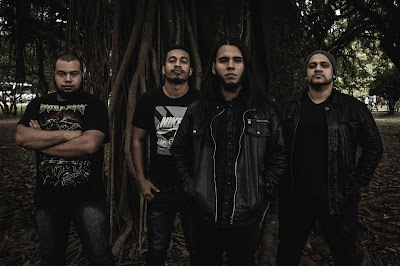 M.H.X’s Chronicles is a brazilian Melodic Death Metal band founded on September 2013 by the guitarist and composer Murillo H. Xavier. The band has 2 released works: The EP 'The Preface' (released on September, 2013) and the full length 'Infinite Ocean' (released on June, 2015), the both produced by Michel Oliveira and Murillo H. Xavier at the Sputnik Home Studio. The band’s concept is inspired on the Irish writer C.S Lewis famous book series “The Chronicles of Narnia”. 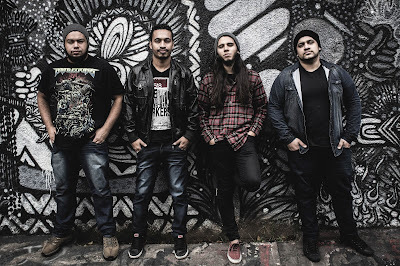 The proposal is to tell a chronicle, a kind of history, in each album (so, there’s the origin of the band’s name), illustrating it all with melodic orchestrations chocking with an aggressive instrumental and the Murillo H. Xavier’s brutal vocals. Hi Xavier, thanks a lot for this interview. It is very interesting to know much more about your band. As far as I know, it was born as one-man-band (the initials of the moniker prove that, as they are your initials), then it evolved as full band, what can you say about the beginning of M.H.X. 's Chronicle? And what about the current line-up? Hey Franz! First of all, thank you a lot for this place in your website. It’s a pleasure for me to talk a little bit more about M.H.X’s Chronicles. Thanks for the support. So, I was 17 years old when I began this project. There was no intention of being much more than an unpretentious instrumental project. Something like a “bedroom guitaristic music” if I could define it. I’ve already played in other bands, so I hadn’t much reasons to compose something like that unless to have a portfolio. Also because I was invited to play in a workshop in that time. So, I started to compose the first EP (called 'The Preface'). It has already the mainly project’s concept but nothing much evolved. But I realize that I could take the project to a new dimension. So, I decided to search new influences to mix in the first intention and I called great friends to enjoy the band. 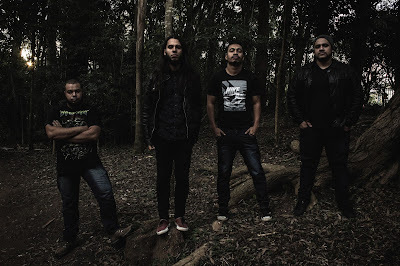 Michel Oliveira (Seven Seals of the Apocalypse, M.O Project and Code 3-7) for the guitars, Raphael Carvalho for the drums (Dominus Vobiscum, M.O Project) and Wallace Ribeiro (M.O Project and Code 3-7) for the bass. I have to admit that the cover cd impressed me a lot, why this choice and what does it represent for you? Has the ocean any particular meaning for you? I was impressed too the first time I saw it. 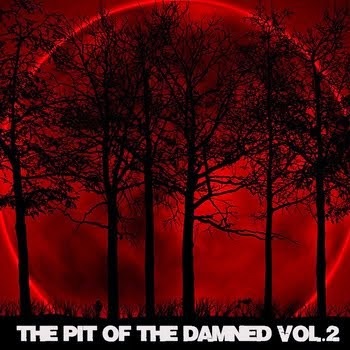 Fernando Kao is the responsible for this cover art. I do recommend him for everyone who wants to do any kind of art. About the choice, yes, there’s a special reason for my choice. The history behind this album is real (even if the history is shrouded in allegories). It tells histories about a hard period in my life when I couldn’t find any reason to carry on. So, the only thing I could do was “sail away” through the life. On the “ocean” I could realize that I couldn’t do anything alone because I hadn’t strength for this but with help I could face my fears and troubles and finally find the peace of mind I was searching for. So, throughout the album the ocean has a lot of different meanings. Maybe I could explain track per track in another opportunity. I like very much your sound due to your ability to combine a folkish feeling with the swedish sound of Dark Tranquillity and In Flames, not forgetting the heavy classic of Iron Maiden, what can you say about your influences? Do you think that the bands I mentioned are part of your background, including also Dream Theater and Children of Bodom? Yeah, our sound has some influences of some bands you mentioned, directly or indirectly. 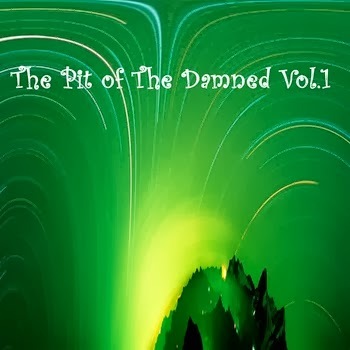 I intended to bring a kind of folkish sonority mixed with the heavy, epic and melancholic influences of the Melodic Death Metal bands from Europe. Wolfheart (and Before the Dawn as well), Insomnium, Wintersun and others were on my players when I was composing 'Infinite Ocean'. About the Progressive influences, I can’t run of it. This is the “school” I came from. Even if I don’t want I would put some prog taste. And there’s a little bit of world music. Enya and Yanni are included on it. I have quoted Dream Theater, as I consider your sound technical and progressive, so Brazilians are not only the best in football? Haha, it’s kind of you. Unfortunately we are no more the best on football after losing 7-1 to Germany. It’s sad haha. But yes, we have many excellent musicians here in Brazil. Playing Metal or not. It’s not for nothing that the new Megadeth’s guitar player is Brazilian. And we have regional music that is much more technical and progressive than many bands I’ve already heard. You probably have already heard about Tom Jobim. I also suggest you listening to Yamandu Costa or Hermeto Pascoal. Virtuosity on the highest level. We have a lot of great things here. Football is just the most famous. 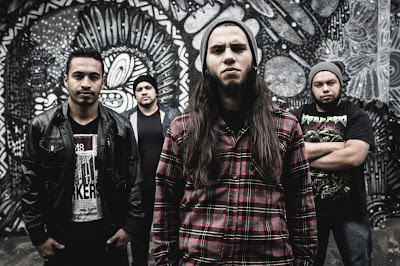 As you are from Brasil, I expected to listen to in your sound also some influences from Sepultura, but nothing; indeed, I was able to listen to some alternative rock and some points of contact with HIM and Devin Townsend, what can you say about that? I’m not into Sepultura music (even one of my favorite drummers is Eloy Casagrande) and maybe the way I took the band’s sonority got a little bit far from Sepultura’s sonority. On the other hand, I intended to bring something of Devin Townsend’s. The way he makes the textures of his songs is incredible. He’s one of my favorite musicians and the next M.H.X’s Chronicles album will have more influences of Devin’s music. Let's speak about the lyrics of 'Infinite Ocean', what can you say, are you responsible for them? and what about the music? Is there a contribution of the other members or are you a sort of Dave Mustaine? How a song by MHX's Chronicles born? And which is the importance of the voice in the economy of each single song, as it changes from growl to clean? Everything you can listen on 'Infinite Ocean' was composed by me. Since the lyrics until the strings lines was made by me and the mixing and mastering were made by the spectacular Michel Oliveira. Of course I thought on how my band mates play, mainly the drums line (that has some guesses of Raphael), but in short everything was made by myself. The first thing to compose a MHX’s Chronicles song is to capture the right feeling I want to feel in. First of all the song has to make me feel something and I have to feel exactly what I want this song illustrates. It’s like to compose a soundtrack for a movie. It has to combine with the scene I have in my mind. And, as a good soundtrack does, it has to send shivers up your spine. Everything is a texture and I have to find the right one to paint my canvas. Here’s the vocals function. Every vocal kind changing is a new texture I put on it. That’s why I put much kind of vocals as the growl, fry, clean and a little bit of drive in few parts. I was able to touch a melancholic feeling in some songs (e.g. The Way Home, At the End, or Outcry), where this feeling was born? Is there any influence coming from your daily life or from the situation of your country, for example the favelas, that contributed to amplify such kind of sadness? The melancholy is one of the textures I intended to put on this CD. As I said before, the history is real. So, this melancholy came directly from my daily life on those times. I just tried to capture that feeling and transform in songs. I used to observe the raining days or the peaceful movement of the ocean in a cloudy day. I imagined even a snowy winter and what would be the soundtrack playing in a Finnish frozen forest, haha. So, everything was texture for the central history. I mentioned "Projector" by Dark Tranquillity as your source of ispiration in some points, am I right or that album did not have any impact in your sound? Actually, I didn’t listen to it on the composing process. The sonority can be next because of the similarity on our kind of sound. But there was no directly influence of it. What about the metal scene of your country and in particular of your city, San Paolo? Could you recommend some interesting bands? Being frank, this is the hardest part on have a band in Brazil. We have many talented bands here but we don’t have opening to show our music. Venues rarely open their doors to authorial bands and, when it happens, always for free. And I can go beyond. Sometimes we have to pay for play, selling tickets for the venue and don’t having neither a help in the fuel money. We have only injuries and loss of money. I lost the count on how many times I offered the M.H.X’s Chronicles concert for free in many venues and the answer (when they did it) is always a superficial “no”. That’s why I intended to direct our music to other countries. It’s sad because we have excellent bands here that sometimes have to stop just because of these things. But, sure, there are always bands that keep standing up and fighting for their place. I mention here a particular band of great friends that also recently released their first full album. The band is called “Seven Seals of the Apocalypse”. Totally outstanding! It will worth it. What about the live aspect of the MHX’s Chronicles, are you playing somewhere in your country? Do you perform something special during your show, could you tell me more? We recently played in some places that opened their doors to us to divulge our new album. We have just played at “A Cúpula Fest” with our brother from Seven Seals of the Apocalypse, Quinta Travessa, Palavras ao Vento and many others. It’ll be a good time! We are playing a standard set list that includes some music from 'Infinite Ocean' and one cover song. “Remembrance” of Before the Dawn is the next cover we’ll play. And we are preparing a MDM version of (sorry tr00s-headbangers-fromhell haha) Coldplay’s “Clocks”. My last question: during my face-to-face interviews in my radio show, I am used to ask the "Desert Island List": three books, three records and three movies you can’t live without, what about yours? Three books: The Chronicles of Narnia (Specially “The Voyage of the Dawn Treader”), “Silmarillion” (or anything from J.R.R Tolkien) and the Bible. Three records: “Black Clouds & Silver Linings – Dream Theater”, “Deathstar Rising – Before the Dawn” and “Storm the Gates of Hell – Demon Hunter”. Thanks a lot Xavier, hope to see you in Italy very soon, perhaps supporting Dark Tranquillity. One more time Franz, thank you a lot for the support and to give me this place on your website. I hope to see this beautiful country very very soon! Grazie Mille!